Born and raised in Beirut, Tarek is a New York-based, Lebanese-American award winning composer and a jazz pianist who taught himself jazz the age of 19. Since the release of his debut "Ashur" in 2012, Tarek has been reinventing classical Arabic music within the framework of African-American jazz in a genre often dubbed "Afro-Tarab" and most evident in his second album "Lisan Al Tarab: Jazz Conceptions in Classical Arabic". Following the commission by the Abu Dhabi Festival, Tarek went on to research and write new music based on the largely unexplored rhythms of the Arabian Peninsula. The new work entitled "Peninsular" was released to critical acclaim and described as "a world-jazz heard nowhere else" (TSF Jazz), "luminous music anchored in jazz harmony and Arab traditions" (Télérama), “striking, rather atypical, rich, varied… to urgently insert into your playlists” (Jazz Magazine) and "the most beautiful surprise of the beginning of this year" (Jazz News). Winner of the prestigious "Thelonious Monk Int'l Jazz Composers Competition" for his composition "Sama'i Yamani", Tarek has been part of two all-star global concerts of the International Jazz Day and shared the stage with luminaries such as Wayne Shorter, Richard Bona, Zakir Hussein, Esperanza Spalding, Antonio Sanchez, Regina Carter and Vinnie Coliauta. He performed around the world in venues such as the Smithsonian Institute (Washington, DC), National Sawdust (NY), David Rubenstein Atrium (Lincoln Center, NY), Boulez Saal (Berlin), Dizzy's Cub Coca Cola (Jazz at Lincoln Center), MuCEM museum (FR), the United Nations Assembly Hall (NY), Gran Teatro de la Habana (Cuba), New York University (Abu Dhabi Festival), the Blue Whale (Los Angeles), the Detroit Institute of Arts, New Morning (Paris), Aaron Davis Hall (NY), and King’s Place (UK) to name a few. Since moving to NYC in 2011, Tarek has played as a leader or sideman in New York's most renowned jazz clubs such as the Lenox Lounge, Iridium, Smoke, Smalls, Cornelia Street Cafe, Bill’s Place, The Stone, Le Poisson Rouge, Shapeshifter Lab, Nublu & 55 Bar. In April 2013, Tarek founded, organized & produced a cutting-edge performance called “Beirut Speaks Jazz” which aims to promote jazz in Lebanon by igniting adventurous collaborations between artists from the worlds of rock, pop, tarab, rap and blues over the foundations of jazz. So far the event has been a great success gathering 36 musicians on one stage and in different combinations. Among the invited artists were Hamed Sinno (Mashrou’ Leila), Oumeima El Khalil, Erin Mikaelian (Pindoll), Tania Saleh, Poly, Aziza, Mazen El Sayed (El Rass), Chady Nashef, Wassim Bou Malham (Who Killed Bruce Lee), Elie Afif, Makram Abol Hosn and many more. Tarek is the recipient of many grants such as the Baryshnikov Arts Center artist-in-residence, the Abu Dhabi Festival Commission, the Thelonious Monk Jazz Composers Competition, the Givanas Foundation grant, the Huygens scholarship, the Andrea Elkenbracht award, the Cultural Resource grant (Al Mawred), the Prins Bernhard Culture fund, the Betty Carter Jazz Ahead residency (did not attend), the New Dutch composition contest, and the Arab Fund for Arts and Culture (AFAC). 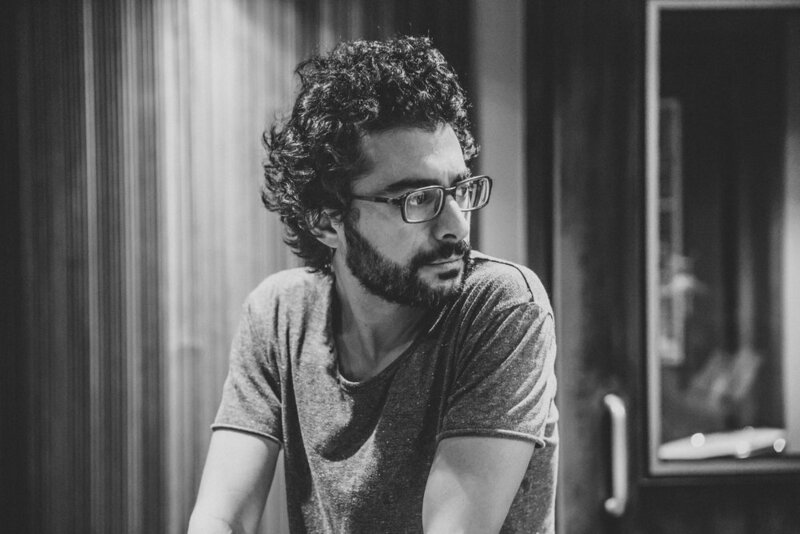 As a film composer, Tarek has scored numerous short films such as "I SAY DUST", a film by Darine Hotait which screened in 70+ festivals around the world and was shown on BBC, Sundance TV and AMC Network, and the most recent "LIKE SALT". As an author, Tarek has written and self-published two books about rhythm: "Duple vs Triple: A Melodic Approach to Mastering Polyrhythms in Jazz and other Groove-Based Music in 56 Steps" and "The Percussion Ensemble of the Arabian Peninsula". Tarek holds a BS in Computer Science from the American University of Beirut and a BA in Jazz Piano from the Prins Claus Conservatory of Groningen. Peninsular (2017) -- Portraits in Khaliji Rhythms and Jazz -- "Trailblazing pianist transforms Khaleeji music (CNN)"
Lisan Al Tarab (2014) -- Jazz Conceptions in Classical Arabic -- "A sublime and innovative exploration of the common ground between Jazz and Arabic musical heritage (All About Jazz)"
"Duple vs Triple: A Melodic Approach to Mastering Polyrhythms in Jazz and other Groove-Based Music in 56 Steps." with Herbie Hancock during the 25th anniversary of the Monk Institute, Washington DC. February 2018 / Artist-in-residence at the Baryshnikov Arts Center, New York City. April 30 2017 / Performed at the 6th edition of the International Jazz Day at the Gran Teatro de la Habana, Cuba. September 2016 / Commissioned by the Abu Dhabi Festival to compose "Peninsular: Portraits in Khaliji Rhythms and Jazz"
November 2014 / Speaker at Middle East's largest creative conference Nuqat. February 2014 / Received the Mawred grant to fund his second album as a leader entitled "Lisan Al Tarab: Jazz Conceptions in Classical Arabic". January 2014 / Tarek’s concert in Dubai was nominated as Best Gig for the Time Out Dubai 2014 Music and Nightlife Awards. November 2013 / Music juror for the 2013 grant cycle of the leading Arab Fund for Arts & Culture (AFAC). April 2013 / Tarek founded, organized and produced “Beirut Speaks Jazz”, a distinctive initiative which aims to bring jazz closer to the Lebanese audience in a unique approach. September 2012 / Tarek’s ASHUR Promotion Video (directed by Darine Hotait) was an Emmy Awards finalist, Los Angeles. April 2012 / Invited to perform at the historic inaugural of the International Jazz Day, held at the United Nations Assembly Hall in New York City on April 30. October 2010 / Awarded first prize of the prestigious “Thelonious Monk Jazz Composers Competition” sponsored by BMI, for his composition Sama'i Yamani (feat. Rasha Rizk). July 2010 / Semi-finalist at the “Montreux Jazz Piano Solo Competition”, in Switzerland. June 2010 / Received the prestigious Prins Bernhard Cultural Foundation Grant in the Netherlands. February 2010 / Selected to participate in “Betty Carter’s Jazz Ahead 2011” residency in the Kennedy Center, Washington DC. May 2009 / Received BA in Jazz Piano from the Prins Claus Conservatorium with 10 (highest possible distinction granted in the Netherlands). May 2009 / Tarek’s composition “Theme & Variation” won the New Dutch Contest & was recorded by the West Coast Big Band in Amsterdam. September 2009 / Received the Andrea Elkenbracht Fonds award from the municipality of Groningen, the Netherlands. January 2007 / Received the prestigious Huygens Scholarship, from the Dutch Ministry of Education, Culture & Science. November 2005 / Received the Givanas Charitable Foundation scholarship to study in the Netherlands. June 2001 / Received BS in Computer Science from the American University of Beirut.